The short ballot movement set forth the principles that only those offices important enough to attract and deserve public examination should be elective, and that only a few offices should be filled by election at any one time. The movement began in the United States in 1909, led by Woodrow Wilson, then president of Princeton University. The short ballot issue was closely linked with a general drive to centralize government responsibility by decreasing the number and/or lengthening the terms of a few elective offices and simplifying governmental organization. At least since 1915, North Carolina governors had pointed out the need for a short ballot and fewer elected officials to achieve satisfactory administrative management within the state government. In that year Governor Locke Craig told state lawmakers: "If the General Assembly should clothe the governor with the power to appoint all of the administrative officials of the state, except those named in the Constitution, it would accomplish a reform of immense benefit." In his 1917 inaugural address, Governor Thomas W. Bickett urged the legislature to enact a law that all state administrative officers "whose election by the people is not required in the Constitution shall be hereafter appointed by the Governor." In 1930 Governor O. Max Gardner received the results of a survey that he had commissioned from the Brookings Institution. Based on the findings, Gardner recommended that the legislature adopt a short ballot, cut the number of state officials to be elected, and expand the governor's appointive power on the premise that if the chief executive was responsible for a broad program, he should have commensurate authority to appoint the officials who would carry it out. The General Assembly of 1931 enacted some of Gardner's proposals into law but not the short ballot. As North Carolina state government continued to grow, the need to simplify and streamline the executive branch concerned governors and legislators from time to time. Reorganization has become a constant feature. For example, in 1969 Governor Robert W. Scott established the State Government Reorganization Study Commission, and in May 1970 he appointed a 50-member citizen Committee on State Government Reorganization. In November 1970 voters approved a constitutional proposal requiring the executive branch to be reduced to 25 departments by the end of 1975. Scott's committee recommended implementation of the constitutional amendment in two phases. With strong support from Scott, the General Assembly ratified the Executive Organization Act of 1971. This measure divided the executive branch into two groups: agencies headed by elected officials and those headed by appointed administrators. The General Assembly passed the Executive Organization Act of 1973. The initial reorganization was in fact mostly completed by the mandated time-the end of 1975, followed in the 1980s and 1990s by additional legislation to further reorganize executive departments. In the early 2000s several key offices, in addition to the governor and lieutenant governor, remained elective, including the attorney general, the secretary of state, the state treasurer, the superintendent of public instruction, and the commissioners of agriculture, insurance, and labor. Paul V. Betters, State Centralization in North Carolina (1932). Roma Sawyer Cheek, A Preliminary Study of Government Management in North Carolina (1950). North Carolina Manual, 1999-2000 (2000). Craig, Locke. "Biennial Message to the General Assembly, Session 1915: Administrative Officers Should be Appointed by the Governor." Public letters and papers of Locke Craig: Governor of North Carolina, 1913-1917. Raleigh [N.C.]: Edwards & Broughton Printing Co. 1916. p.31-32. http://digital.ncdcr.gov/u?/p249901coll22,424000 (accessed November 30, 2012). Bicket, T. W. "Inaugural Address of T. W. Bickett Governor Of North Carolina: The Short Ballot." Public Documents Session 1917. Raleigh [N.C.]: Edwards & Broughton Printing Co. 1920. p.16. http://digital.ncdcr.gov/u?/p249901coll22,152171 (accessed November 30, 2012). Bicket, T. W. "Message of Governor T. W. Bickett to the General Assembly of 1919: The Short Ballot." Public Documents Session 1919. Raleigh [N.C.]: Edwards & Broughton Printing Co. 1920. p.11. http://digital.ncdcr.gov/u?/p249901coll22,153512 (accessed November 30, 2012). 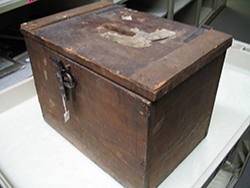 Bicket, T. W. "Final Message to the General Assembly of 1921: The Short Ballot." Journal of the House of Representatives of the General Assembly of the State of North Carolina. Raleigh [N.C.]: Mitchell Printing Company. 1921. p. 18. http://digital.ncdcr.gov/u?/p249901coll22,539285 (accessed November 30, 2012). "Device, Voting, Accession #: H.1994.237.1." 1900-1954. North Carolina Museum of History.